Paper Party Plates, Plastic Party Plates, & Disposable Dinnerware. Make sure every single one of your party attendees is well fed with delicious party treats by stocking your party food table with extra party plates and disposable dinnerware. Available in paper or plastic and in bulk quantities, serve up portions of appetizers, snack foods, and/or cake on durable plates and bowls. It doesn’t necessarily have to be for parties only. You know there will be those days where the thought of cooking, dirtying dishes, and then having to wash said dishes seems less than appealing. We’ve all had them. That’s why it’s a good idea to keep spare disposable dinnerware and paper plates on standby. 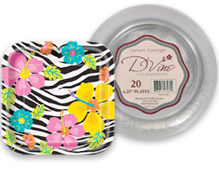 Party paper plates, plastic party plates, plastic bowls, and dessert plates are available in multiple sizes from 7 inches to 10 inches. Prevent accidental spills and stop your guests from digging around your party food platters with their bare hands with bulk party plates from 1SuperParty. For any wedding, birthday, cookout, picnic, tailgate party, beach party, luau, barbeque, hoe-down, or shindig, 1SuperParty is your source for discount party supplies, bulk party supplies, birthday party supplies, and party accessories. All orders over $25. Applies to lower U.S. 48 states only. Send it back within 60 days for a full refund. We love our customers & want you to be satisfied. Our experts are standing by to take your order.